If you thought internet prices with the big providers were too high, this will be music to your ears. Vodafone has slashed prices on its NBN products, reducing prices across all three of the speed tiers available, making its plans some of the cheapest in the market. Customers can now receive unlimited data and the Standard speed for just $58 a month, while the Standard Plus speed tier costs $69 a month and the Premium speed tier only $89 a month. Prices are ongoing and not promotional. Existing Vodafone postpaid mobile customers can also receive a $10 monthly discount on the two latter plans, bringing the prices down to just $59 and $79 respectively. Vodafone’s Chief Commercial Officer, Ben McIntosh, said the price reductions mean better choice for customers in an already crowded market. “Our $58 NBN 25 plan is outstanding value with nothing to pay up front. And to further reward our postpaid mobile customers, they can upgrade to our NBN 50 plan for just a dollar more per month,” he said. 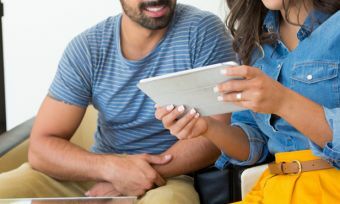 Customers get access to Vodafone’s 4G backup modem, which falls back to 4G internet on Vodafone’s network if NBN connection is lost or is yet to be setup. The modem costs $180 upfront if customers only stay for a month. Over 36 months the cost of the modem is effectively reduced to $0. As part of the release, Vodafone also commissioned Galaxy Research to report on Australians’ internet habits. “There has never been a better time to revaluate your broadband plan – to look for the most affordable way to get the speed you need,” Mr McIntosh said. Where does Vodafone sit in the NBN market? Vodafone is still a relatively new player in the National Broadband Network market, only offering NBN plans since about late 2017. With the latest price changes, Vodafone comes in with one of the cheapest entry level plans in the market. Earning a discount for being an existing Vodafone customer is also not a new phenomenon; Optus offers a similar $10 discount on its broadband plans. Vodafone does not advertise its ‘evening speeds’, which is usually a reduction in the maximum speed tier available. Rather, the telco states in its Critical Information Summaries that speeds are variable and can be confirmed once the NBN service is activated. The 4G backup modem is speed-limited to 12Mbps download and 1Mbps upload – about in line with NBN 12 speeds.